Several studies show the positive impact of natural elements on office productivity. Most employees spend close to eight hours working indoors. So, instead of providing them with a sterilized office space, you can introduce a biophilic design. If you are not looking for a complete overhaul, you can incorporate natural textures by way of painting. Choose earthy tones and natural shades including leafy green, sky blue, brown soil, etc. to introduce nature in the work-space. Add different textures with the help of exposed brick walls, wooden arches, stone tables, and more. Why Hire A Commercial Painter? While planning a commercial painting project, we need to consider several things. We live in a busy world. None of us have the time and energy to research different color combinations and paint brands to ensure the best results. On the other hand, having a professional painter will make things simpler for you and your business. Now, do not waste time on any inexperienced painter. It is essential that you choose a professional commercial painter instead of a residential home painter. A commercial painter has a big painting crew which means he will be able to finish work quickly. Also, he is more likely to work according to your schedule and even finish painting by working all night or during weekends. The most essential thing that will compel you to select a commercial painting company is its comprehensive range of services. Usually, the services of residential painters are limited to interior and exterior painting. And, commercial painters can help you with installation of new flooring, power washing, sandblasting, and several other auxiliary services to make your office look good. 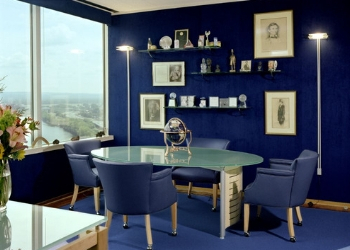 Do you want to paint your office? Are you looking for an experienced commercial painter in Toronto? You have come to the right place. Perfect Painter not only helps you with reliable home painting services but also offers the best office painting solutions at affordable rates. Get in touch today for a FREE commercial painting estimate.